Scientists who study the brain have it tough. Unlike, say, cardiologists or researchers who study the digestive track, neurologists have few lab tests, few opportunities to actually watch the human brain in action. There are a few rare exceptions. One comes with patients who have intractable epilepsy and seek brain surgery to remove the source of their seizures. Nate Bennett is one such patient. Nate relaxes in his hospital bed, waiting to detect changes as tiny jolts of electricity enter his brain. In his back pocket, Bennett carries around a black leather wallet, about the size of an envelope, attached to a keychain. He made it himself. His teeth have left deep scars in the leather. That’s a good sign: it means he had time to prepare. “I tend to bite my tongue during the grand mal portion of the seizure,” says Bennett. From the outside, a seizure looks like the product of a brain in chaos, but in reality, it’s the opposite. In an epileptic seizure, millions of neurons stop what they’re doing and suddenly begin firing in lockstep. Robert Fisher, Director of the Stanford Epilepsy Center, compares it to a crowd at a football game. In centuries past, this looked to many like a spiritual possession. Joan of Arc may have had epilepsy. So might have Saint Teresa de Ávila. Over time, scientists have learned that epilepsy is a window into the brain. In fact, the notion that certain parts of the body are controlled by certain parts of the brain was an insight first gleaned by the 19th-century English neurologist John Hughlings Jackson, when he observed an epileptic seizure that seemed to travel from one part of his patient’s body to another. To Jackson, this was a clue that the disease was affecting parts of the brain in succession, each with a corresponding effect on the body. Depending on where a seizure strikes, a patient may lose or alter his sense or smell, flail his hands, or suddenly recall a specific childhood memory. “Epilepsy gave us our first clue that parts of the brain are responsible for parts of the body, or different senses,” says Edward Chang, a neurologist and neurosurgeon at the University of California San Francisco. In recent years, patients being treated for epilepsy have become active participants in this research. Nate Bennett is one of them. Over the last few years, Bennett’s epilepsy has become almost disabling. He’s having one or two grand mal seizures a month, sometimes in the middle of the workday. He’s unable to drive, and worries about having to go on disability and losing his health insurance. Medication isn’t helping. That makes him a candidate for surgery to remove the part of his brain that’s causing the seizures, and, possibly, cure his epilepsy. At Stanford Hospital, where Bennett’s being treated, there are two stages to this process. First is a surgery to implant electrodes -- in this case, thin plastic wires each about an inch-and-a-half long -- into his brain. I visit him as he’s waking from anesthesia. He’s groggy, but he gives me a thumb’s up. “I’m putting reality back together here… gradually,” he says, with a smile. 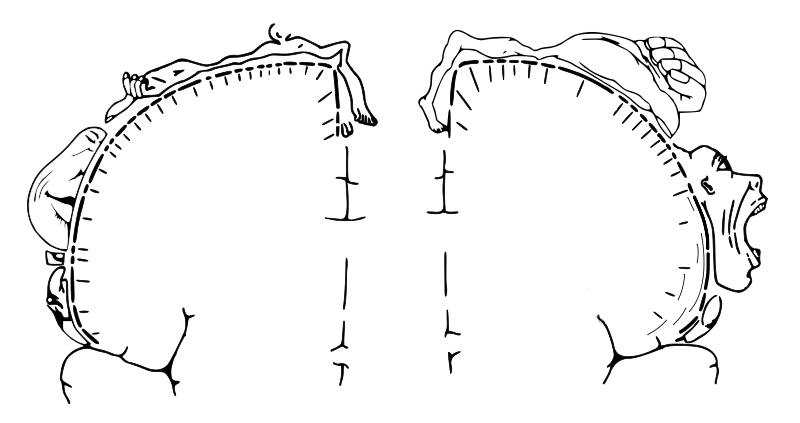 A doctor tells Bennett that while he was unconscious, a surgeon implanted seven electrodes in his brain, two on the right hemisphere, five on the left. “What a party,” Bennett replies wryly. 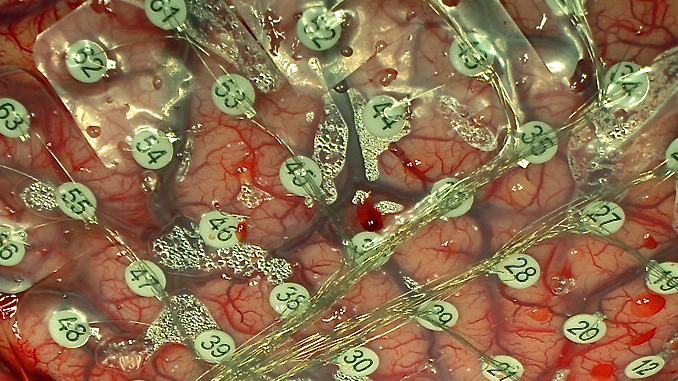 In surgery, a grid of electrodes is applied directly to a patient's brain. The electrodes can record changes in electrical activity at a fine level of detail. The electrodes are intended to record exactly what happens in Bennett’s brain when he has a seizure. This can tell his doctors where his seizures are coming from and, in theory, which part of his brain to remove. It means spending a week or more in the hospital, off meds, waiting for seizures to strike. 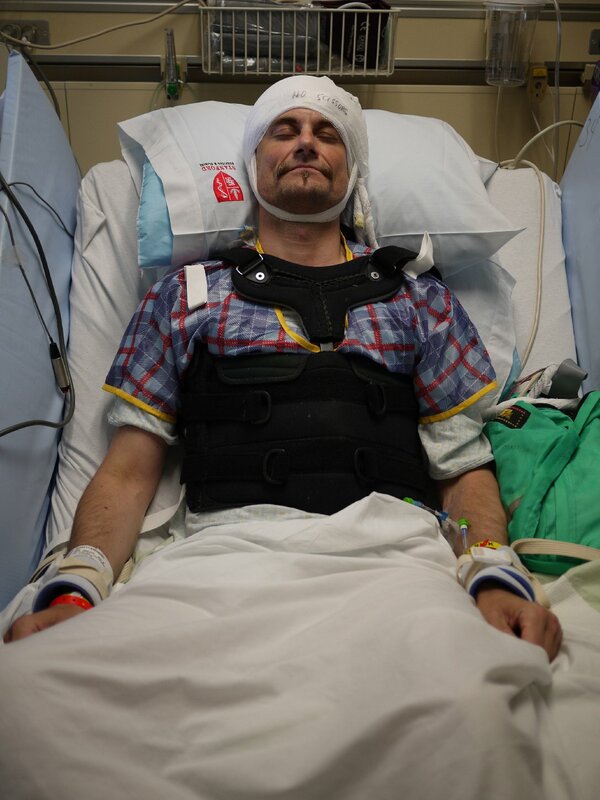 When I visit him the next day, Bennett’s head is swathed in bandages. A thick braid of electrical wires hangs from his left temple. He’s hanging in there, he says, but he wishes he’d have a seizure, so that his doctors might have some information to work with. To keep himself occupied, Bennett’s brought a bag of musical instruments and a copy of "Siddhartha," by Hermann Hesse. One night, in which he’s instructed to stay awake as long as possible so as to hasten seizures, he watches a "Spongebob Squarepants" marathon on TV. But there are a few other things to do, including a functional mapping session with Bennett’s neurologist, Dr. Josef Parvizi, an associate professor of neurology at Stanford University. On the day of the mapping, Dr. Parvizi wheels a cart with an electrical console and a laptop to Bennett’s bedside. Before surgeons remove part of Bennett’s brain, his doctors will want as detailed a picture of his brain as possible. Where, exactly, are the parts that control his vision, for example, and his motor control? These are things you want to know before you take out the scalpel. Dr. Parvizi tells Bennett to take a deep breath and relax. As Bennett leans back in his bed, Parvizi sends a series of tiny electrical pulses into different parts of Bennett’s brain. The jolts are too small to cause Bennett any pain, but the results can be dramatic. “It kind of felt like somebody was poking me with a finger right here, “says Bennett, pointing to his forehead. Next, Parvizi sends a signal to an area called the anterior cingulate, involved in automatic speech such as reflexive vocalizations like “ouch,” or laughter. “Let me know if anything changes,” says Parvizi calmly. Some of this is helpful for understanding Bennett’s epilepsy, but some of it is pure science, a rare opportunity for mind control, to simulate parts of the brain and see what happens. The cortical homunculus (after the Latin for "little man") indicates which parts of the brain control which parts of the body, and the relative amount of neural area involved in different functions. Scientists and many patients see this as a win-win. For Bennett, it’s a way to “make something positive,” he says, out of his long medical journey with epilepsy. For Chang, Parvizi and other scientists, it’s amazing access. In doing this work, they and others have identified parts of the brain involved in forming words, counting and recognizing faces, among other things. In many cases, they can turn these abilities on and off like a light switch. The idea is that when you start learning where certain abilities live in the brain, you come closer to finding new ways to fix them when they break down. Take, for example, dyslexia or depression, says Parvizi. Parvizi needs to wait for Bennett to have a natural seizure. But he also wants to stimulate the part of his brain that causes Bennett’s seizures, to elicit an “aura,” the particular sensation that can precede a seizure. Parvizi sends a small electrical signal to Bennett’s temporal lobe, a part of the brain thought to be implicated in his seizures. Parvizi asks Bennett to say more, but he falls silent. His face hardens; his eyes become fixed on a spot across the room. A doctor moves quickly to Bennett’s side and injects him with a dose of medication intended to stop the seizure. A nurse ushers me out of the room. When I next look in, Bennett is sleeping peacefully. His seizure has been recorded, his brain mapped at the finest level of detail possible with today’s technology. He is, he hopes, one step closer to a life without epilepsy.